Here's an "easy" Armada article. There's only one Neutral Officer in Wave 7! Guess who's stock just rose thanks to the flotilla nerf? 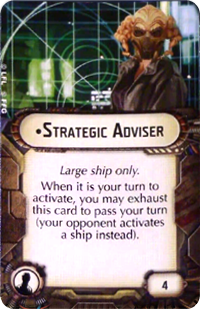 Strategic Adviser is the cheapest way to delay your activations, and now with only 2 Flotilla allowed per list, it is going to be an even more crucial officer card for large base lists that need multiple activations to work. Especially any Rebel lists that want to be last, as they don't have Pryce to give them an automatic final activation. Also important in the most recent FAQ is that the "you" in Strategic Adviser refers to the ship it is equipped to. So you (the player) can't use Strategic Adviser if you wouldn't be able to activate the ship in the first place. 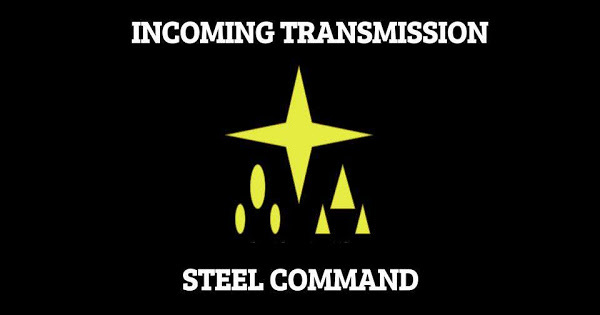 Ships that have already activated, or are prevented from activating at a specific time (i.e. a Raddus deployed ship) would not be able to use Strategic Adviser to pass, so plan your turn out accordingly. Speaking of Raddus, and Pryce, how does Strategic Adviser work within the context of other activation cards? With Drunkle Raddus - Strategic Adviser as First Player against a Raddus fleet can force a different ship than the Raddus deployment (which cannot activate if no other ships have activated) to activate instead. Useful if you want to force your opponent to move something into position. Again, Strategic Adviser on the Raddus deployment with First Player won't be useful, as you cannot use Strategic Adviser if the Raddus deployment would not be allowed to go anyway. With Gov. Pryce - Strategic Adviser cannot be used to pass so that Gov. Pryce is forced to move. As no ships exist that can take two officer upgrades for the Imperials, there is no reason to argue about a Strategic Adviser and Pryce on the same ship. Expect this card to see a lot more table time with flotillas being limited to two per list. Gotta pad those activations somehow, and 5 is still the magic number.